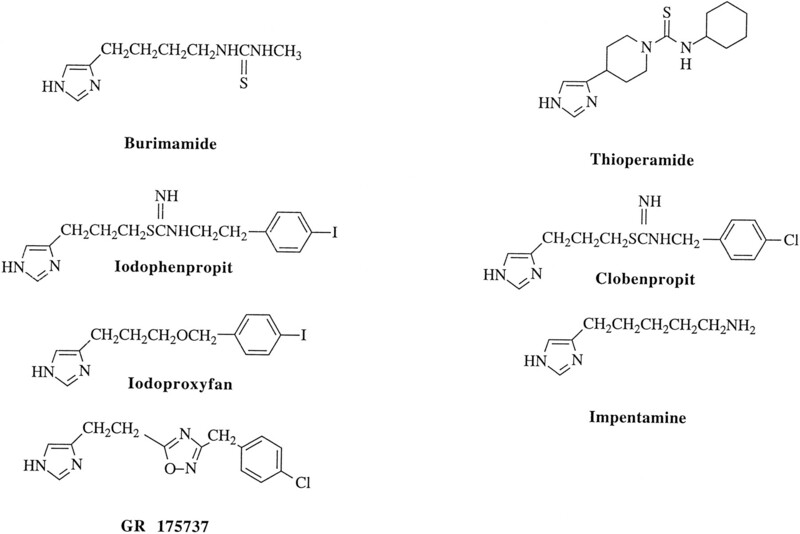 Histamine receptor agonists (H1, H2, and H3). 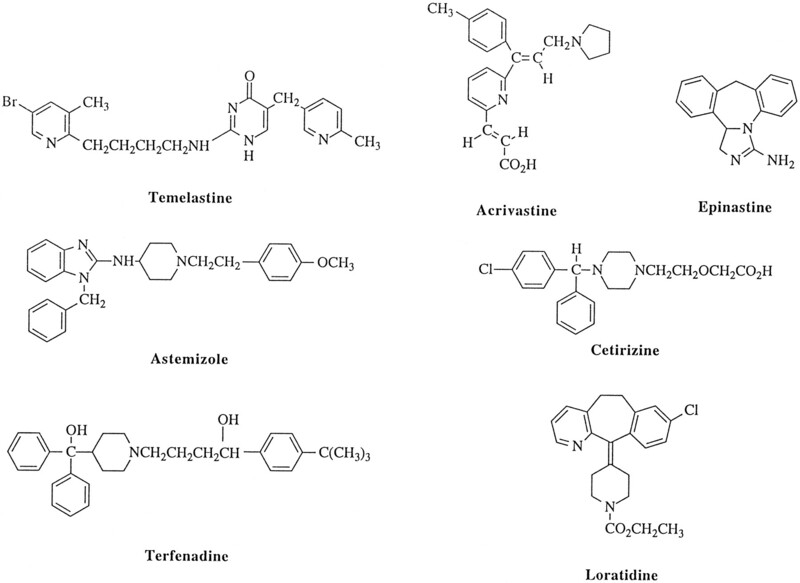 “Nonsedating” H1-receptor antagonists. 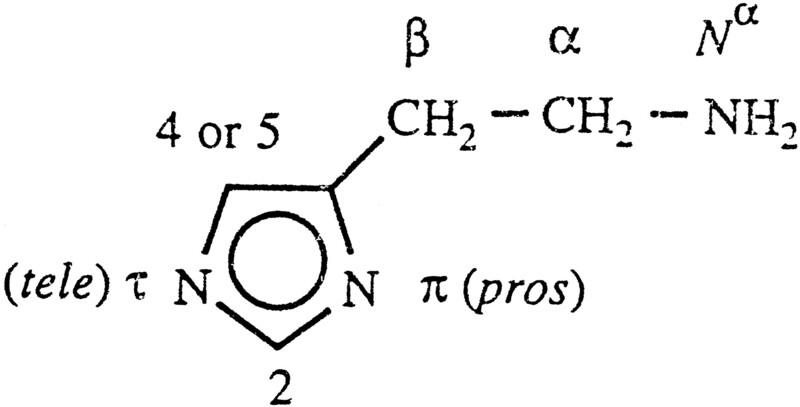 †, The pharmaceutical product may be a mix of (E) and (Z) forms. 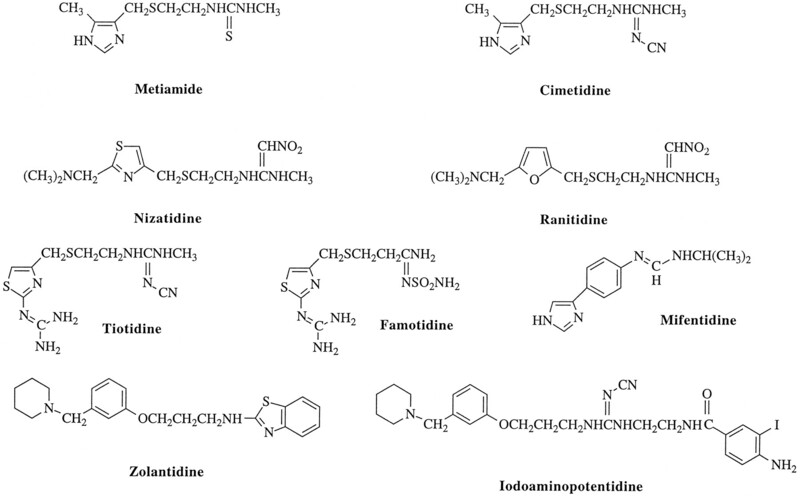 Alignment of amino acid sequences of the human histamine H1- and H2-receptors. 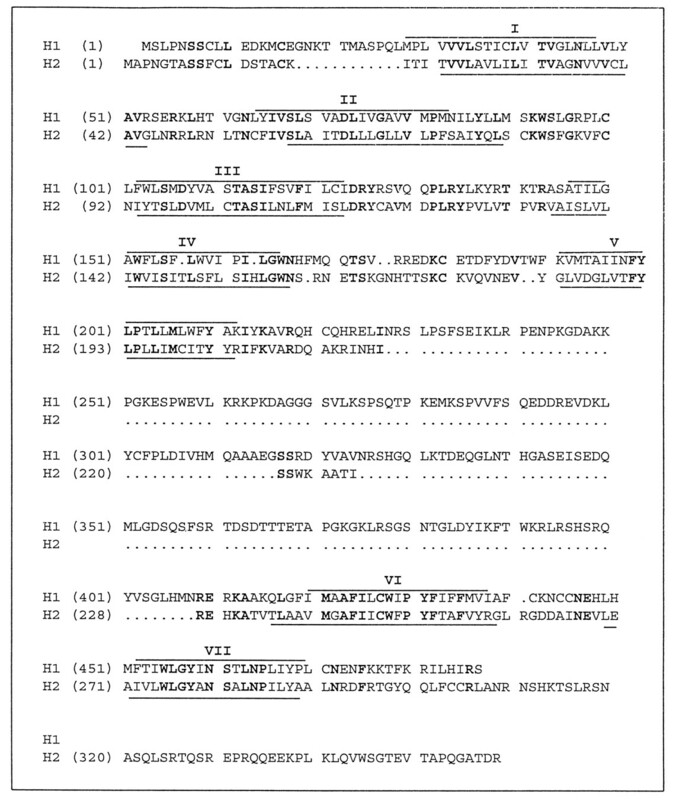 Residues that are identical in the two sequences are shown in bold. Lines show the putative transmembrane spanning domains. Values determined from guinea pig ileum contraction (H1), guinea pig atrium (chronotropic stimulation, H2), and inhibition of K+-stimulated histamine release from rat cerebral cortical slices (H3), or inhibition of electrically stimulated contraction of guinea pig ileum (H3). n.d., not determined. ↵2-p KB = 56 nM. ↵2-q KB = 3 μM. 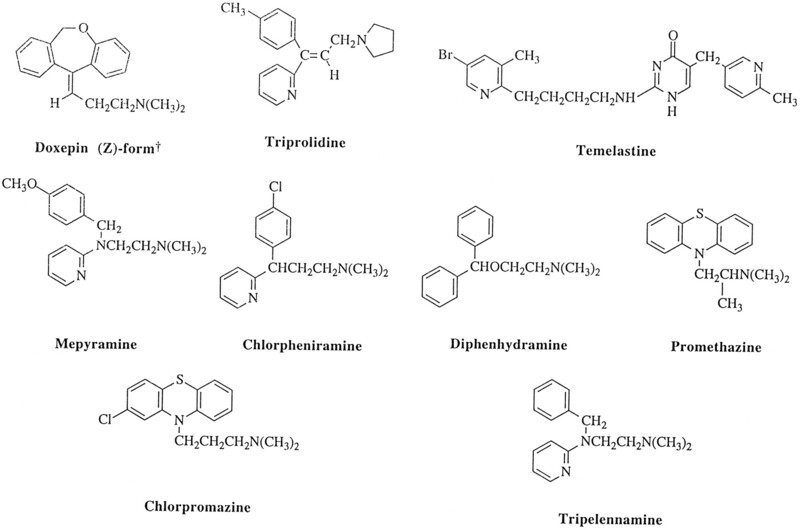 Doxepin 0.06 nM3-a n.d. n.d.
Triprolidine (trans) 0.1 nM3-b n.d. n.d.
Temelastine 0.3 nM3-c >10 μM3-c n.d.
Diphenhydramine 1.0 nM3-j n.d. n.d.
Promethazine 1.2 nM3-k 3.0 μM3-l n.d.
Chlorpromazine 1.2 nM3-k 5.9 μM3-l n.d.
Tripelenamine 3.2 nM3-d n.d. n.d.
Famotidine n.d. 17 nM3-q n.d.
Iodoaminopotentidine 1.1 μM3-w 2.5 nM3-w n.d. Values determined in functional assays from guinea pig ileum contraction (H1), biochemical determinations in guinea pig cerebral cortical slices (H1), chronotropic responses in guinea pig atria (H2), cyclic AMP accumulation in guinea pig hippocampal slices (H2), inhibition of histamine release in rat cerebral cortical slices (H3), and inhibition of transmurally stimulated guinea pig ileum (H3). n.d., not determined. 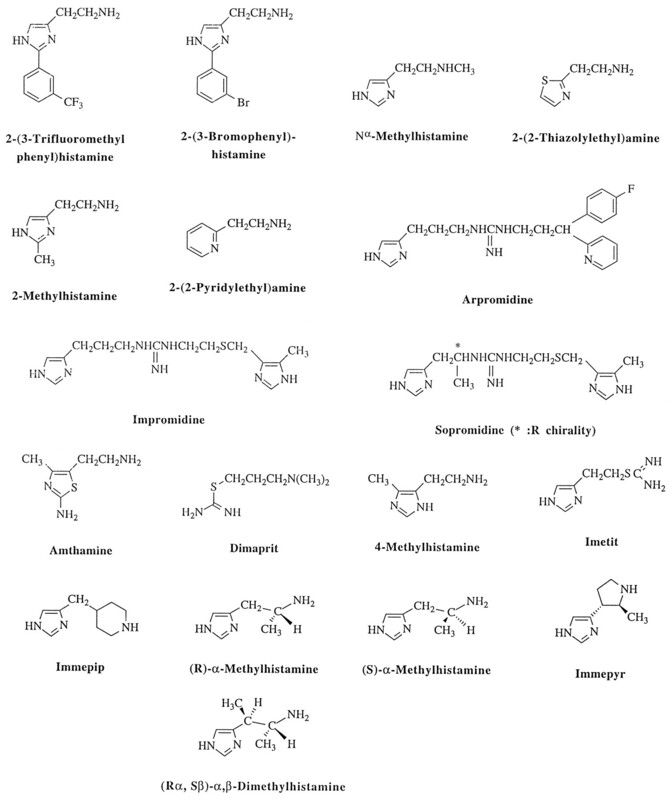 Unless otherwise stated, values show Kideterminations from inhibition of [3H]mepyramine binding. n.d., not determined. ↵4-a h1 = transfected H1-receptor cDNA. ↵4-b H1 = native/endogenous H1-receptor. ↵4-c Values in parentheses show the values obtained from functional studies of the endogenous H1-receptor present in rat C6 cells (Peakman & Hill, 1994). Values are pKi (−log dissociation constant) determined from inhibition of [3H]mepyramine binding in homogenates of guinea pig cerebellum. Measurements were made of H2-mediated adenylyl cyclase activity in homogenates of guinea pig hippocampus, impromidine-stimulated cyclic AMP accumulation in guinea pig hippocampal slices, and of H2-mediated cyclic AMP accumulation in dissociated hippocampal tissue. n.d., not determined.